Capturing the impact of social sciences on other disciplines is notoriously difficult. Daniel Holman, Rebecca Lynch, and Aaron Reeves have looked at the example of health behaviour interventions (HBIs), a field recently criticised for failing to draw on alternative, social sciences approaches that emphasise the structured and contextual aspects of behaviour and health. A bibliometric analysis of the HBIs field over the last decade reveals that despite an increase in the number of papers published, the proportion of those that explicitly address issues related to social context has actually diminished. Rather than continuing to focus on individualistic explanations of behaviour, a more thoroughly interdisciplinary approach is required; one that adopts a more nuanced conception of how the social and cultural context shapes behaviour. Social scientists sometimes complain their work has little impact on other disciplines but measuring impact is incredibly difficult. We sought to explore the impact of ideas across disciplines in the context of research on health behaviour interventions (HBIs), an area where some have claimed social science conceptualisations of behaviour from disciplines such as sociology and anthropology have not been taken seriously. But are such claims accurate? And, if so, to what extent? HBIs attempt to generate behaviour change in order to positively affect health. Interventions might involve public awareness campaigns, “nudging” people into certain behaviours, education or peer support programmes, or individual advice sessions. They tend to be based on theories of behaviour change from psychology and its associated techniques, e.g. goal setting, action planning or motivational interviewing. However, when these theories are taken to the field as part of health behaviour interventions they often have only minimal impact. As a result, some have criticised these interventions for assuming behaviour is only determined by psychosocial factors such as knowledge, motivation, and efficacy, without acknowledging that it is firmly rooted in the wider cultural and social context (e.g. Glass and McAtee, 2006). More recently, there have been a few studies that have not only acknowledged the embeddedness of social action but also tried to leverage that embeddedness to accomplish their goals. For example, the Football Fans in Training programme exploited the cultural significance of football to anchor a men’s obesity intervention (Hunt et al. 2014). Yet, without systematic measurement of the extent to which HBIs acknowledge and exploit social and cultural context, it is difficult to know whether such interventions are an exception. 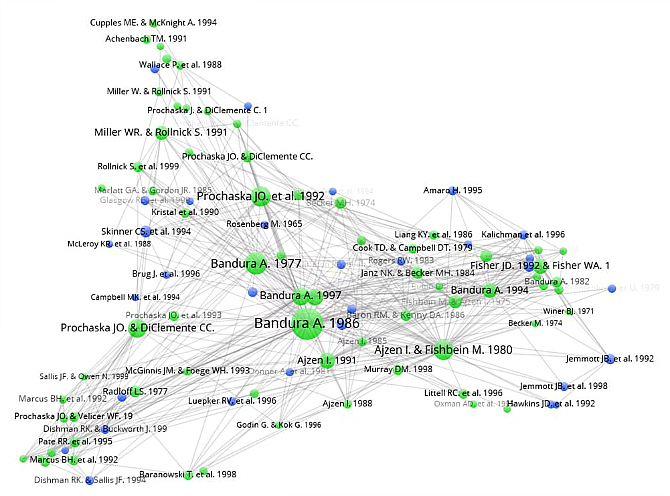 To track the influence of social science concepts on the field of HBIs we used bibliometric methods, measuring both their prevalence in the field and also the network of citations between key papers in the field. We identified our corpus of papers using a carefully designed search strategy in Scopus, which produced a set of 5130 papers. First we searched the key fields in each paper (i.e. cited documents, author affiliation, abstract, keywords and journal title) to identify the dominant trends across disciplines in how social science concepts were being used. This approach aims to detect “delineating subject areas, growing subfields, or disciplinary patterns” (De Bellis, 2009) by exploring how various concepts that signify an awareness of social context are deployed in these 5130 papers. Our search focused on various social science disciplines (including psychology – we followed Bastow et al. here and regard this as a social science/STEM crossover discipline) but paid particular attention to the disciplines of sociology and anthropology given their concern with issues of social context. 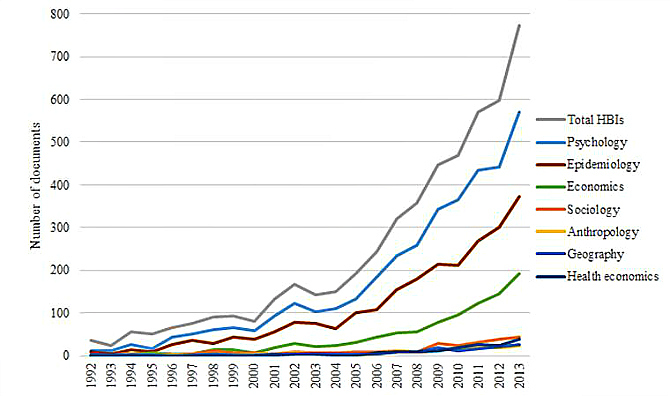 The representation of social science disciplines focused on social context has been low for quite some time, but since 2006, when the number of HBI documents started to increase markedly, the representation of these disciplines, and associated concepts relating to social context (graph shown in full paper), has actually declined. HBIs appear to be increasingly abstracted from the messiness of everyday behaviour. Figure 1: Disciplinary representation in HBIs. Graph lines represent the number of documents that mention different disciplines. Source: Holman et al. (2017). How do health behaviour interventions take account of social context? A literature trend and co-citation analysis. To explore this further, we used a bibliometric technique called co-citation analysis which takes a large corpus of papers on a particular topic, extracts all references from these papers, and then analyses which of these references are most commonly cited together. The intuition behind this analysis is that documents that are cited together share some kind of intellectual affinity. The resulting co-citation data can then be visualised to produce a map of “relationships among documents/key concepts, to outline and graphically visualise the structure of a research field, its connections with other fields, and its articulation into subfields and new research fronts” (De Bellis 2009). We analysed patterns of citations before and after 2006 as this is when the rapid increase in the number of HBI papers occurred. To trace the impact of social context in the field, we coded papers which paid attention to this context, marking them as blue, while all other papers are shown in green. Figure 2: Document co-citation analysis for pre-2006 HBI papers. Blue circles represent documents that refer to social context, green circles are all other papers. Source: Holman et al. (2017). How do health behaviour interventions take account of social context? A literature trend and co-citation analysis. Figure 3: Document co-citation analysis for post-2006 HBI papers. Blue circles represent documents that refer to social context, green circles are all other papers. Source: Holman et al. (2017). How do health behaviour interventions take account of social context? A literature trend and co-citation analysis. Social context papers (blue circles) have diminished in number post-2006, and instead of being dispersed amongst the field as with the pre-2006 graph, they are now mostly confined to a particular topic, namely on the issue of tailoring interventions. Pre-2006, the social context papers tended to be community studies or interventions targeted at disadvantaged populations, but these topics are no longer present post-2006. Interestingly, back in 2006, Glass and McAtee argued that behavioural science was at a crossroads in public health in terms of whether it took the path of properly considering social context or whether it went further down that of increasingly individualistic, atomised explanations of behaviour. Our analysis suggest the HBI field took the second, more individualistic, path. Why does this matter? At a time when the public purse is tightening and health inequalities stubbornly persist, we must think of ways to affect behaviour that are not only more likely to be effective, but do so in a way that improves the health of all. In our paper, we present numerous arguments for a more thoroughly interdisciplinary approach to behaviour change and suggest that recognising how behaviour is embedded in a particular social and cultural context may be a promising way forward as it is familiar to those from a wide range of disciplines. Researchers, policymakers, academics, clinicians and other stakeholders have a role to play in shaping such an approach to this now burgeoning field of health behaviour interventions. This blog post is based on the authors’ article, “How do health behaviour interventions take account of social context? 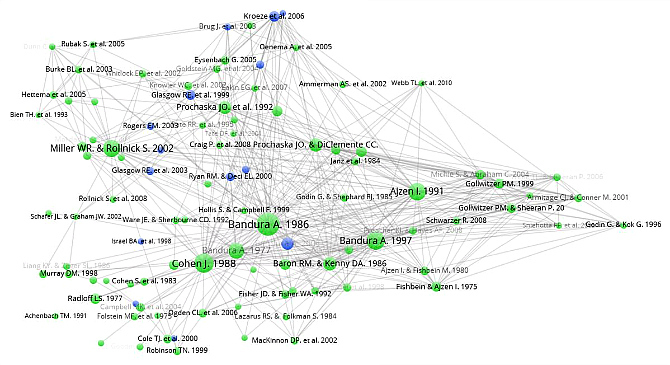 A literature trend and co-citation analysis”, published in Health: An Interdisciplinary Journal for the Social Study of Health, Illness and Medicine (DOI: 10.1177/1363459317695630). Daniel Holman is a Research Associate in the Department of Sociological Studies at the University of Sheffield. He is interested in the overlaps between public health and sociology especially in relation to health inequalities, and has recently been focussing on inequalities in ageing, especially in relation to policies to extend working lives. Rebecca Lynch is a Research Fellow in Medical Anthropology at London School of Hygiene and Tropical Medicine in the Faculty of Public Health and Policy. Her work focuses on social and cultural concepts of health and the body, investigating how these are constructed by individuals and communities as well as by medics and public health scientists. She has worked on numerous evaluations of health behaviour interventions in England and Wales as well as undertaking research with patients and communities within and beyond the UK. Aaron Reeves is Associate Professorial Research Fellow in the International Inequalities Institute at the LSE. He works on the political economy of health and the cultural politics of class. His research has been published in The Lancet, the British Journal of Sociology, and Poetics. Thank you for this interesting blog post! I was wondering if you considered articles published in the field of information systems in your literature analysis? Especially in the area of e-health there seem to be quite a studies that draw on social theories to design health intervention strategies. Colleagues of mine and I, for instance, therorised about the relationship between Facebook and obesity (e.g. Durst, C., Viol, J. and Wickramasinghe, N. (2013), “Online social networks, social capital and health-related behaviours: A state-of-the-art analysis”, Communications of the Association for Information Systems, Vol. 32, pp. 134–158.). Also, there is a lot of research on mobile intervention strategies (e.g. Hamper, A., Wendt, J., Zagel, C. and Bodendorf, F. (2016), “Behavior Change Support for Physical Activity Promotion: A Theoretical View on Mobile Health and Fitness Applications”, 2016 49th Hawaii International Conference on System Sciences (HICSS), IEEE, pp. 3349–3358. ).